Pan-seared ribeye steaks are an effortless quick dinner for any day of the week. And when paired with aromatic herb butter for steak, you’re sure to impress! Everyone has their go-to quick and easy meal they serve again and again each week. We may call them a family favorite. In reality, it may not even be the most favorite one, but everyone seems to be content with it. Am I right? We have that meal too. It’s fried rice made with whatever leftover we have. And quite frankly, it’s mostly steak fried rice. Simple, quick and completely satisfying. We love our steaks! Preferably grilled. But since we get to enjoy only couple of months of actual grilling season, I learned to cook our steaks in a pan to perfection. 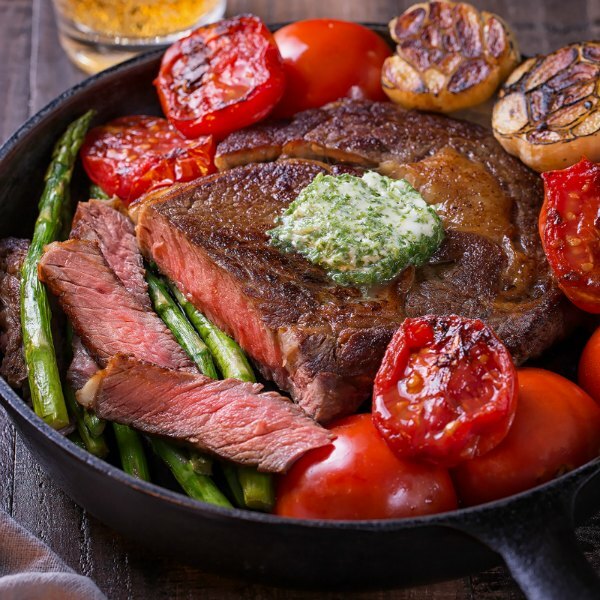 So, today I wanted to share with you my tips for perfectly pan-seared ribeye steaks. Buy at least 1-inch thick steaks. I usually go for 1 1/2-inch ones, but I hear 2-inch steaks the best! If at all possible, start with steaks at room temperature. It cooks evenly that way. I usually defrost the steaks overnight in the fridge, and then take them out 1-2 hours prior to cooking. But if you haven’t planned that far ahead, no worries, it won’t taste much difference. Generously salt and pepper the steaks at least 40 minutes prior to cooking, so that salt can penetrate deep into the meat. And for more specific why’s, read this article. But again, if you don’t have time to wait 40 minutes, salt them right before cooking, and not sooner. Use cast iron skillet for the best crust. And heat it well before cooking. The oil should be sizzling hot when you add the steaks. Oh, and if you have little ones around, make sure they’re not nearby, because hot oil splatters!! The steaks cook within 10-15 minutes, but you do need to rest it for good 10 minutes before cutting and serving it. And as much as steaks are delicious on their own, I love to serve ours with aromatic herb butter, aka compound butter, to make it even more special. It’s quite easy to make, and freezes well to last you for a few more meals. For herb butter, you can add absolutely any herbs you have on hand or whatever you love. Parsley is always a must for me, then rosemary or thyme are great for herb butter for steaks, and garlic makes everything better! And to complete this meal, I like to roast some vegetables. Asparagus and tomatoes cook in minutes, so is steamed broccoli. These are my favorite vegetables to serve steak with. But of course, you can never go wrong with good old mashed potatoes! And there you have it. Hope you’ll serve this fabulous dinner soon. Let me know! And thanks for reading. Pan-seared ribeye steaks are an effortless quick dinner for any day of the week. 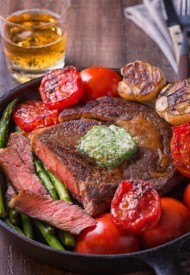 And when paired with this aromatic herb butter for steak, you’re sure to impress! 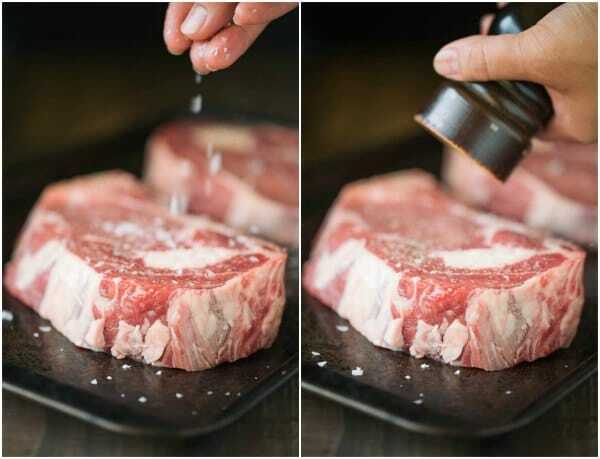 To cook the steaks, if possible bring the steaks to room temperature by taking them out on the counter for 1-2 hours. Generously salt and pepper the steaks at least 40 minutes prior to cooking, OR right before cooking. Heat cast iron skillet over high heat. Add oil and heat until smoking. Carefully place the steak in the skillet, using a tong, and cook for 3 minutes. Turn and cook for another 3 minutes, and then turn again and cook for another 3 minutes. Start checking for doneness with a meat thermometer. (It should read 120-125°F for medium rare steaks.) Sear the sides of the steaks as well. 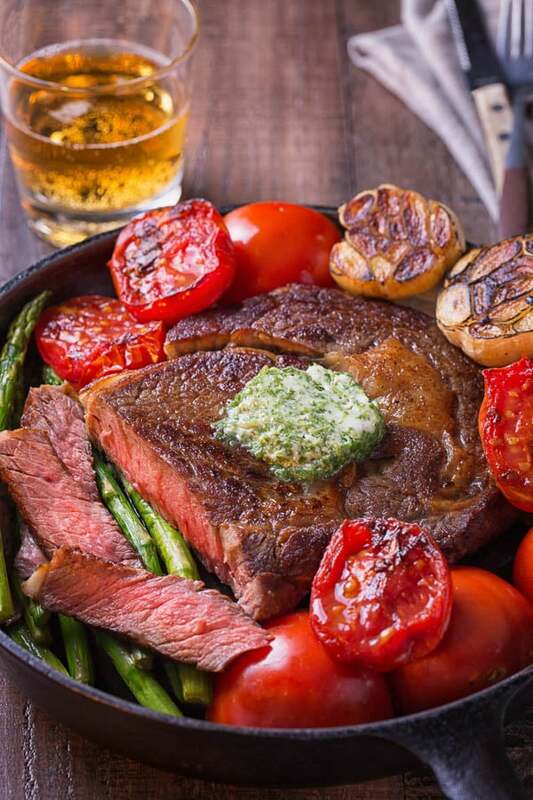 Remove the steak onto a wooden cutting board. Cover with foil and rest for at least 10 minutes before cutting and serving. Repeat with the next steak. Top with a slice of herb butter before serving.